Wow! This Arching Chevrolet neon sign is incredible. 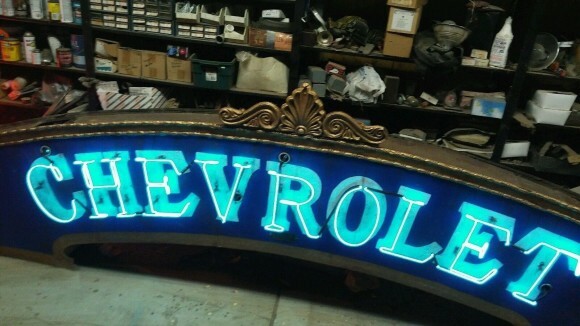 Produced in 1935, this rainbow neon sign is 12.5′ long, 48″ tall, and 12″ deep. The sign most likely weights a ton with all of the intricate metal-work surrounding the actual porcelain. The sign was comissioned by the inventor of neons, Claude Georges, and produced by Neale Rainbow Light Company. The text on this sign reads “Chevrolet, Neale Rainbow Lights, Patented Tube Sign. When this sign is lit, the blue neons only contribute to the stunning scroll work on the upper bronze holder. This is a truly fantastic sign.